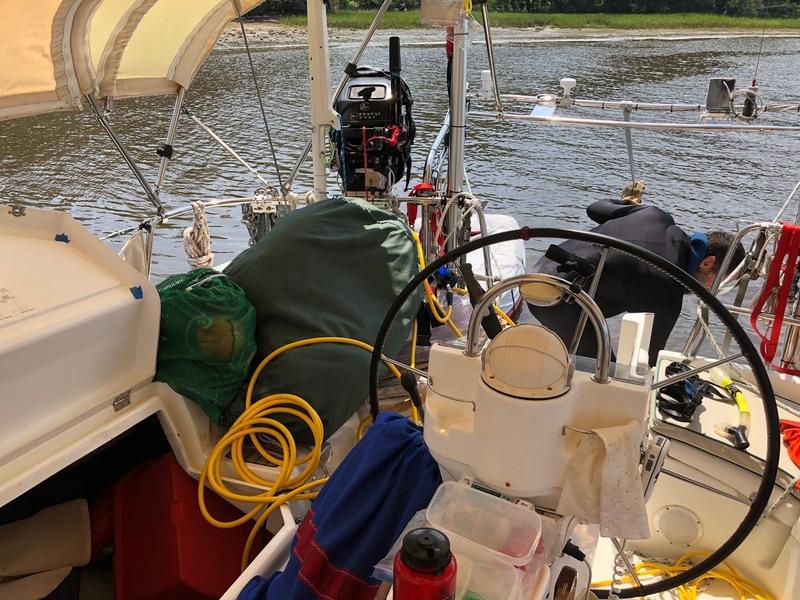 We spent another day at anchor in Calabash Creek. We are planning to go out the Little River inlet tomorrow, so we were waiting for better weather to go offshore. We had enough of the ICW again. Today Dave wanted to get in the water to change our zincs and check the through hulls. 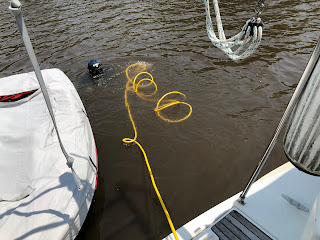 When he got in the water at St Johns Yacht harbor to clean the prop, he noticed that the zincs needed changing. But he wanted to wait until he had time to get out the hookah system for breathing, therefore being able to stay under longer. He also was looking for cleaner water and no alligators. 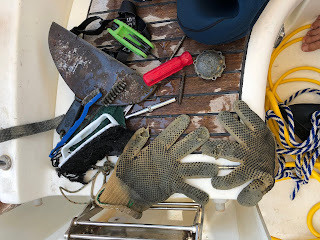 Dave occasionally moves where he stores things on the boat. Unlike me, he doesn’t make any kind of a recording as to where his things are stored. Not that I haven’t offered to do that for him, but I need his help. So… he is digging around looking for the zincs. I hear a lot of muffled grumbling, but can make out one sentence. 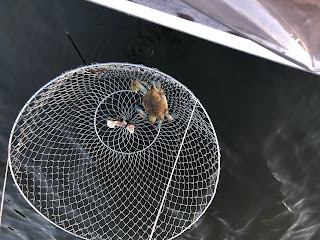 “I just fxxxing looked at them!” He finally found them and I documented that in my app What’s on My Boat. 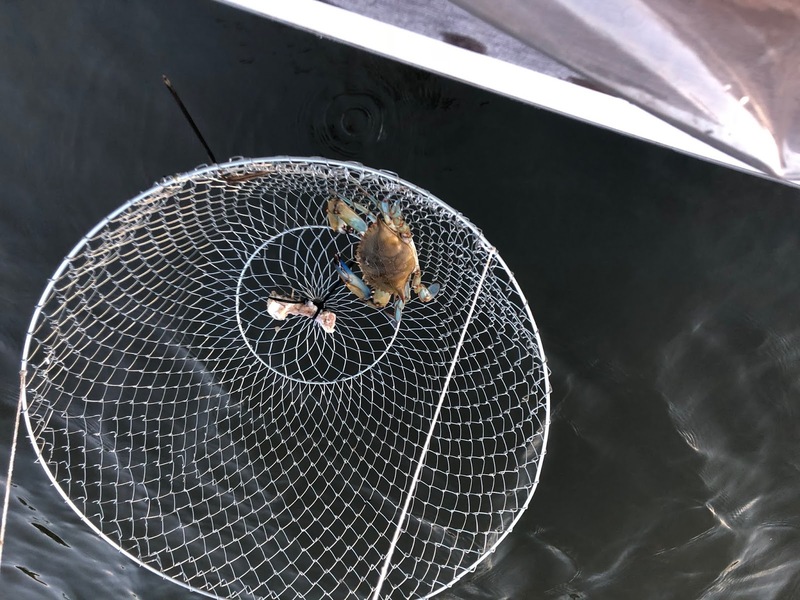 It was about noon by the time he got in the water. He had to set up the hookah air compressor to run off of the Honda generator. He said that makes for a good humming vibration down below. So much that he couldn’t hear boats in the area. He wasn’t concerned with them coming too close. But the wave action will cause him to bump his head on the hull. So while he was in the water, I stationed myself in the cockpit and would thump the boat 3 times whenever a boat was passing. The system seemed to work pretty good. He brought up the zinc that was on the end of the prop. When he reached to the one on the shaft to take it off, if fell off! Guess it was time. We were at that last marina for about 2 weeks. The day we left, they told Dave that they had a problem on our dock with electrolysis. Would have been nice to know that when we arrived. 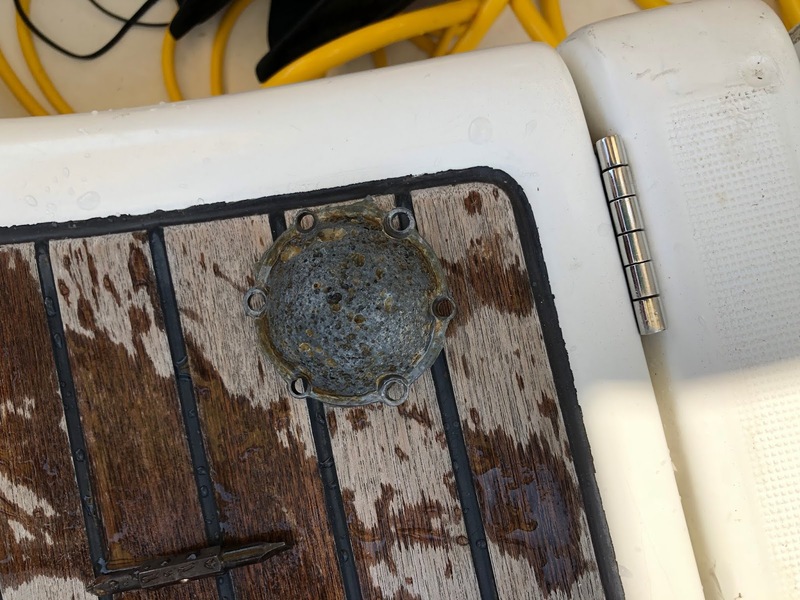 Maybe we could have had a slip on a different dock. Through hulls are connections for water to go in or out of the boat. We have screens at the surface of the hull for every through hull. Those need cleaning occasionally to keep the water flowing freely. 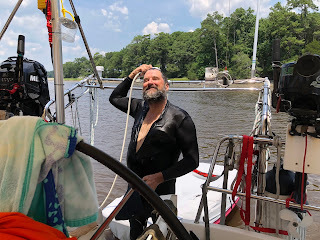 Then Dave spent some time cleaning the hull. We spent the rest of the day listening to soccer and having dinner in our cockpit. It is so nice to have the breeze and NO BUGS!